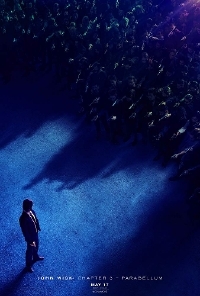 We already knew that everyone was waiting for John Wick but a second trailer leading up to the movie's May release certainly doesn't hurt matters any, especially when it's action-packed and features John Wick riding a horse through the city. Because, why not? In John Wick: Chapter 3 - Parabellum, John is on the run with a bounty of $12 million dollars on his head. While nearly every assassin is looking for a payday, John turns to some old friends or more likely people who owe him favours, for help. In addition to Reeves, the movie also sees the return of Laurence Fishburne, Ian McShane, and Lance Reddick and the addition of Halle Berry, Asia Kate Dillon and the great Anjelica Huston. I'm a big fan of the franchise so far which has mixes some pretty crazy world building with even crazier stunts and it looks like director Chad Stahelski, who returns for the third instalment, is ready to deliver the goods one more time. As long as he manages to keep the energy of the first two movies, this is likely to live up to expectation. John Wick: Chapter 3 - Parabellum opens May 17.